1. 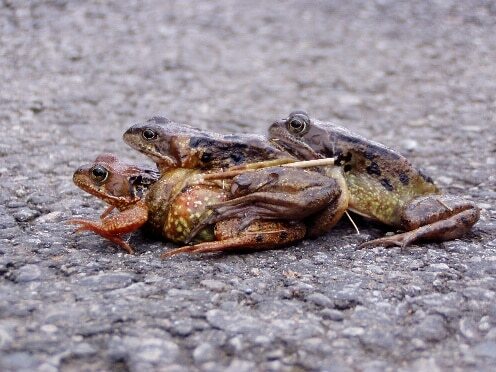 Les Pearce has posted on iSpot a photograph of toads on the move at Badnaban (NC0720) on Tuesday 22nd February. That evening Pat and I noticed a number of small corpses on the road just west of Loch an Ordain (NC0923); they were all toads, males I suspect, from their size and the fact that they are usually the first back to the breeding sites. Although we kept our eyes open, we did not see any other casualties adjacent to regular breeding sites such as Loch Drumbeg and Loch Ruighean an Aitinn. 2. Toads are sometimes a little earlier on the move than frogs in this area. However, alerted by these observations, I went on 23rd to an old tank at Drumbeg (NC1232), which often has early frog spawn, and so it did, three clumps. However, Teresa Weinburg, at Torfeddi, about 100m away, told me that the first spawn appeared in their ponds on 21st, and when I saw it on 23rd there were about ten clumps. She said that males had been vocal almost a week before. 3. Since 1993 I have recorded in my diary the first local spawning dates (that I was aware of), and the variation from year to year makes quite interesting reading. The dates are as follows, with the place and number of the day (counting from 1st January) appended: 18.2.93 (Nedd, 49); 12.3.94 (Nedd, 71); 1995, no date; 7.3.96 (Drumbeg, 67); 2.3.97 (Nedd, 61); 19.2.98 (Nedd, 50); 4.3.99 (Culkein Drumbeg, 64); 7.3.00 (Nedd, 65); 7.3.01 (Culkein Drumbeg, 66); 19.2.02 (Culkein Drumbeg, 50); 26.2.03 (Drumbeg, 57); 17.2.04 (Ordain, 48); 18.2.05 (Ordain, 49); 7.3.06 (Drumbeg, 66, spawn frosted); 23.2.07 (Culkein Drumbeg, 54, spawn frosted); 24.2.08 (several sites, 55); 26.2.09 (Drumbeg, 57); 6.3.10 (Baddidarach, 65); 21.2.11 (Drumbeg, 52). 5. The same sources inform me that common frogs emerge from hibernation when the temperature rises to about 4 deg.C, and that toads require it a little warmer, 5-6 deg.C. Toads start migrating to the breeding sites on the ‘first mild, moist nights with temperatures around 7-10 deg.C’, which fits reasonably well with this year. 6. I had 6th/7th March firmly in my head for first spawning at the Drumbeg tank, having forgotten that it had been as early as 26th February! Which goes to show that memory is fallible, and that one should be on the lookout for frog spawn at any time after mid-February, ideally in the same place each year.